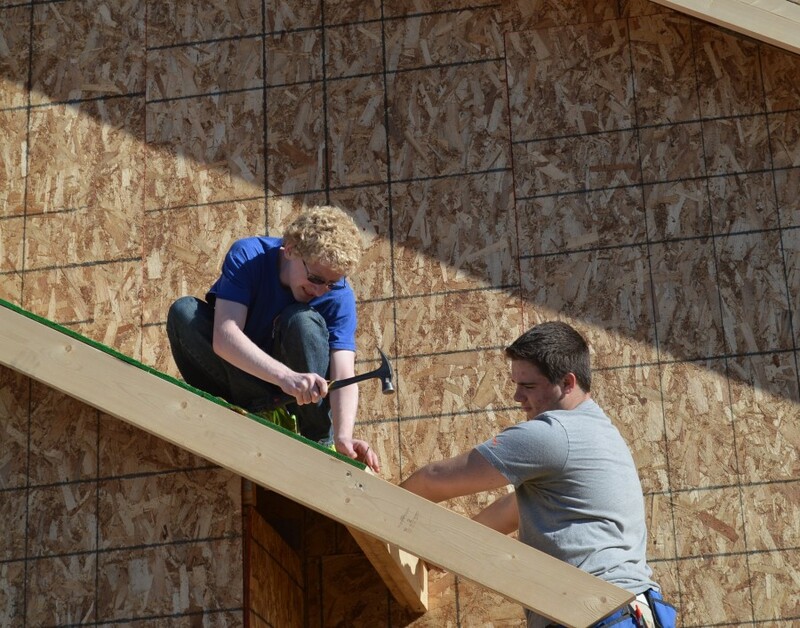 Josh Webber, left, is ready to hammer in a nail on a board being held by Brayden Spore on one of the roof lines. The two Wawasee building trades students are helping to build a home in Elkhart County. ELKHART COUNTY — Last year was the first time Wawasee and Fairfield’s high school building trades programs teamed up to do a project. This year the two schools are again partnering and will do so for a third time next year. For the first 10 weeks of the school year, Wawasee and Fairfield teamed up to build a garage for a house at Syracuse Lake. Next year the project will involve building the house to go with the garage. Beginning Monday, Oct. 19, the schools began working on the roof of a house where the main framing had already been done, noted Ed Waltz, Wawasee building trades instructor. The house to be is located in the Fairfield Farms subdivision just off US 33, west of Fairfield Junior and Senior High School in Elkhart County. Troy and Linda Hochstetler are the property owners. Fairfield, led by instructor Jeff McClure, organized the project, Waltz noted. Waltz described the single story house with basement as the modern ranch style with several different roof lines. “We are trying to get things closed up before the snowballs hit us,” he said, referring specifically to the roof work. The main level of the house covers about 2,000 square-feet and the students will also finish the basement, he added. There are about 40 juniors and seniors between the two schools (Wawasee has 18) and West Noble also has a few. Building trades is one of several programs offered by the Wawasee Area Career and Technical Cooperative. 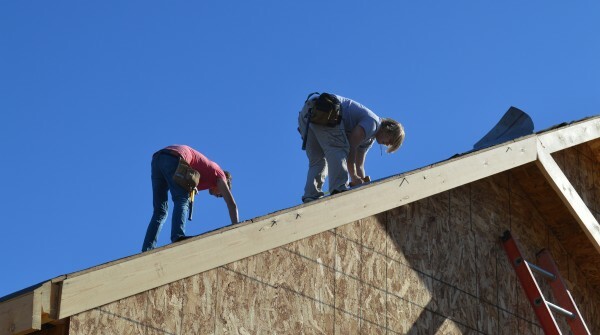 Caleb Bolt, left, and Alan Bontrager work on the roof of a house being built in Elkhart County. The two are Wawasee building trades students.